The closure of the state broadcaster by the coalition government is symptomatic of the brutal austerity being inflicted, reports Richard Simcox, PCS, UK, on the Guardian's Comment is Free. Richard Simcox, PCS, UK reports back on the effects of the brutal austerity measures being imposed on the Greek government by its international lenders. The government dismissed the 2,600 workers at the ERT public broadcaster in June. Since then, hundreds of the technicians and journalists have been occupying the stations around the country and continuing public broadcasts for the past five months. 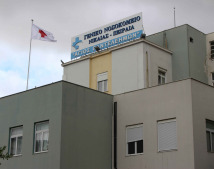 Nikaia General Hospital, one of Greece’s busiest public hospitals, is located in the heart of one of Athens’ poorest municipalities. Nikaia, an area of working people and poor class residents is amongst the most severely affected urban areas of Greece by austerity measures. La Grecia può – 3° puntata: stiamo curando il malato sbagliato? Are we curing the wrong illness? La Grecia ha un primato: quest'anno lo Stato non è riuscito a esigere 60 miliardi di euro di tasse. Non stiamo parlando dell'evasione fiscale, che pure è un fenomeno molto diffuso, ma di tasse dichiarate o richieste dal Ministero delle Finanze, che i greci non sono i grado di pagare o che il corrispettivo dell'italiana Agenzie dell'Entrata non è in grado di recuperare. Nors Graikija – demokratijos lopšys, ironiška, bet būtent šioje šalyje pastaruoju metu iškilo grėsmė demokratijai ir jos principams. Šalies gyventojai nepatenkinti susiklosčiusia situacija ir Vyriausybės vykdomais sprendimais, kurie skirti įgyvendinti griežtą taupymo politiką. At approximately 4:20am Thursday morning, hundreds of Greek riot police forces, along with a public prosecutor, raided the headquarters of ERT, Greece’s national television and radio broadcast station, demanding that employees immediately vacate the premises. To the casual observer, it might have seemed like any ordinary day; perhaps there had been an accident or the police, dozens of police, had merely blocked the streets. 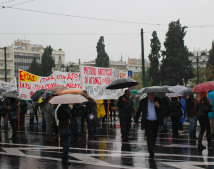 Then, there was the sight of dozens of protestors at the crest of Athen’s Syntagma Square, shouting pro-labor slogans in Greek and sending a message to the government that was nothing if not loud and clear.